Here is my birthday layout for you, Corinne! Journaling: Psst! 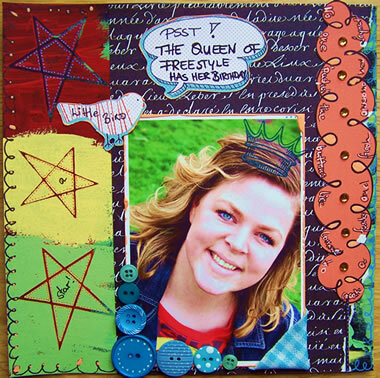 The Queen of Freestyle has her birthday – says the little bird ;-) She’s a star! No one “pushes” the buttons like Corinne to create a fresh awesome new layout. Find ich auch mords schÃƒÆ’Ã‚Â¶n gelungen! LOVE THIS Nat!! :) I wish I’d had time to celebrate Corrinne’s b-day with everyone!